The cost to install a hardwood floor can vary a great deal depending on the material you choose. It will also depend on the condition of the floor area you are covering and how much work you are willing to do yourself. Always ask for a hardwood floor installation estimate from qualified installers. You will have several estimates to compare and you are considering installers that know what they are doing. In addition a high cost area will be the stairs and especially a curved stair way. Placing hardwood on the stairs can sometimes cost as much as a full room. We are going to discuss each of these issues in more detail to give you some idea of what you can be looking at when it comes to making a decision regarding a hardwood floor installation. This portion is definitely a possible do it your self part of the work, however many people will opt to have someone do this for them so it is included in the estimate. You will need to ask for preparation to be included and you will need to be specific about what you want done. We will not say too much here about the material other than the obvious. You will need to purchase sufficient material for the area you are covering with some extra due to bad cuts etc. There are so many possible materials that all we can say is select something that is durable and is pre-finished to minimize the work and the upkeep once installed. As part of your hardwood floor installation estimate, most installations will need a sub floor installed to minimize squeaks when people walk across the floor. This is usually half inch plywood that is screw nailed into the existing floor. At the minimum, you will want to screw nail the existing floor to all joists to minimize the possibility of any squeaks once the hardwood is installed. A reputable installed can install the floor for you, including the unfinished baseboards. Always obtain several estimates as well as references from people you trust before accepting one company or another’s estimate. 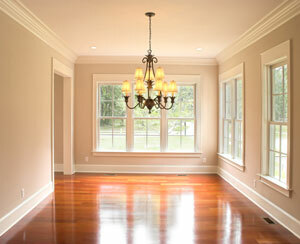 Your estimate should also include installation of the baseboards to completely finish the room. The baseboards may only have the primer coat on them and you will be expected to apply the final coat of paint unless this is something that you also would like included in your estimate. Installing a hard wood floor creates a lot of mess and a lot of dust not only outside but inside your home as well. Consumers can definitely do all of the clean up inside of your home, however the contractor should be doing a minimum cleanup, removing all unused pieces and vacuuming all dust from inside your home in the work areas. Before you move the furniture back into the room, all of the walls and the floor need to be thoroughly cleaned to remove all dust that was created. If you had someone move the furniture out of the room initially, make sure you complete all dust removal before moving the furniture back into the room. There is lots of work that the home owner can take on themselves, including even the installation of the hard wood. It is important to be clear when you are asking for a hardwood floor installation estimate what is to be included and what is not included in the estimate. Comments are welcome about your estimates of hardwood floor installation and how you may have saved some money.